This soup couldn't be easier! Never had escarole? Go ahead - try something new! When I have some spare time, I like to throw together a big pot of soup for lunches and snacking throughout the week. My co-worker, Kim, and I have put together a nicely stocked kitchen at work. Complete with a hot plate, toaster oven, and a George Foreman grill. I will occasionally pop an item into the microwave, but generally try to stay away from using it. I don’t have any real hard and fast evidence that microwaves are harmful, I just prefer the taste and texture of gently warmed foods. Plus, it just seems weird to me that food can be warmed that fast. Anyway… back to the soup! My latest creation was so easy to throw together, it will definitely become part of the regular rotation. Everything in it is a pantry or fridge/freezer staple for me except the escarole. Escarole is a bitter green (from the chicory family) that can be eaten raw, sauteed, braised, or added to soups and stews. Don’t be scared off by the potential bitterness, it is mellowed greatly by simmering in the soup! Whip up a batch, you won’t be sorry! Heat a large stock pot over medium heat. Melt the ghee or butter. Add the vegetables to the stock pot (onion through celery) and saute until just softening, 4-5 minutes. Add in the stock and rosemary and bring to a boil. Lower the heat to a gentle simmer and add the meatballs to the pot. Simmer for about 10 minutes. Add in the escarole and simmer until wilted, about 3-5 minutes more. Season to taste with sea salt and freshly ground black pepper. Enjoy a new dish for lunch or a quick dinner! Recipe adapted from Fine Cooking February/March 2012. 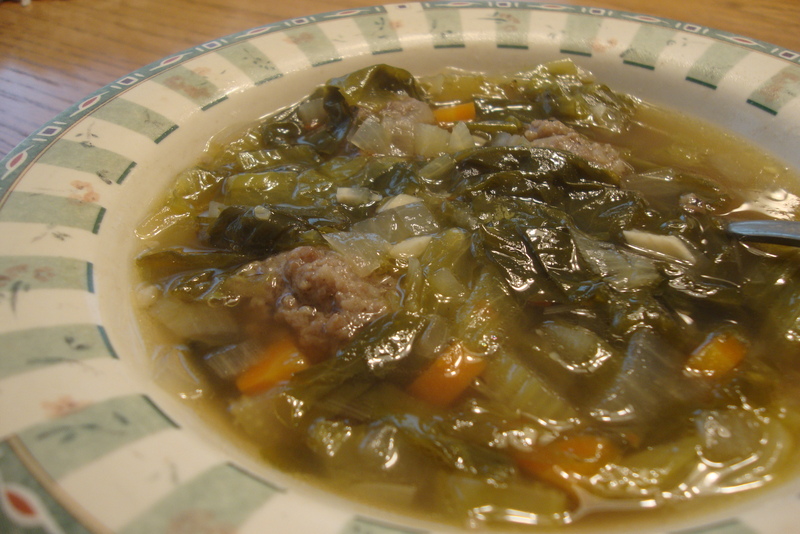 Butter, Carrots, Celery, Escarole, Onions, Pork, Rosemary, Sausage, Stock. Bookmark. The 2012 Paleo Community Survey is here!